Bowling in a friendly and relaxed environment. 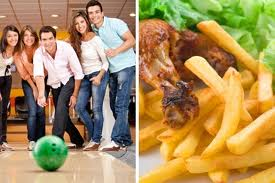 Enjoy a delicious drink or snack and let the ultra modern computer controlled bowling system keep a tally of your scores. Every day from 3 p.m.
Group options also available at other times. On mondays, tuesdays, wednesdays and thursdays until 6 p.m.: 2.50 Euros per game per person. After 6 p.m.: 3 Euros per game/person. All day on fridays, saturdays and sundays: 3.30 Euros per game/person. available. A la carte menu during the weekend.